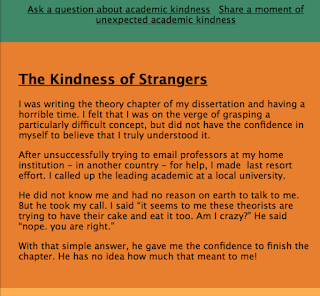 Margo Shea: Academic Kindness is Awesome! It is Monday and we all need some good news. So, from the Department of Good News in the Academy, folks, this is a heads up for any of you who may have missed the great tumblr site, Academic Kindness, which the editor or editors call, " a record of unsolicited kindnesses, unexpected goodwill and excessive generosity in academia." Each post is little more than a paragraph. A story of kindnesses large and small, though, really, mostly small. Hard to say what's greater, the stories themselves or the thought of all the folks who took the time to send in their fine examples of people going out of their way ---- to be receptive, supportive, congratulatory, wise and welcoming --- and sometimes all of the above. On second thought, not hard. It is about the writing, the sharing, the putting into words those things that rarely get shared in any public way. I think this site is one of the best uses of Web 2.0. Because taking the time to articulate and acknowledge the good things that others do, especially when those things don't really benefit the do-er much, if at all --- it makes the world a slightly better place. 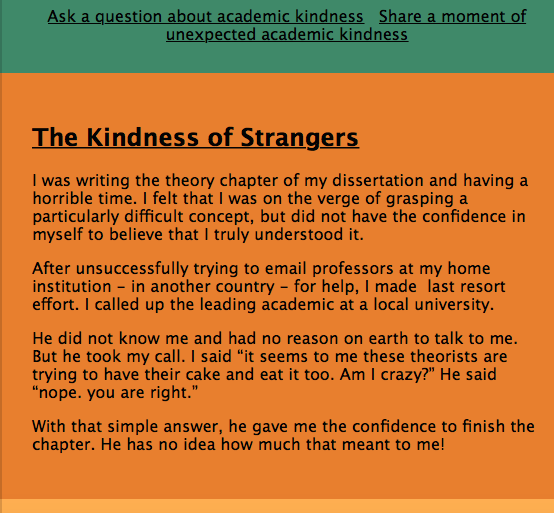 It reminds us that amidst the small-minded, insecure and squirrelly, the craven careerists and the people who talk out both sides of their mouths, there are big-hearted, generous scholars, mentors, educators and administrators who go out of their way to be supportive, welcoming and kind. That we don't get where we get on our own. The faculty member who insisted I be his TA so I could get funded the first semester of grad school. Otherwise, I'd have never set out on this path. The friend who connected me to someone doing a special journal issue on a subject I specialized in, getting me my first real publication. The folks in Northern Ireland who took me in, gave me office space and a project to work on when I was a relatively unskilled MA student. The mentor who supervised my primary field for free from hundreds of miles away because my institution didn't have an Irish historian. The colleague who sat me down and described in minute detail the ways in which I am a good teacher, based on mandated/pro forma classroom observations that were part of a performance review. 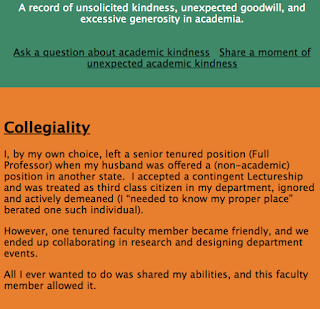 Academia is lonely a lot of the time. I love this opportunity to remind ourselves and others that it is also a community. We don't get where we get alone. There is help along the way. What about you? Was someone kind to you, just because? Did someone go out of their way to provide encouragement, connections, suggestions for funding or places to publish? Who shaped your journey? Share the love, everybody. Share the love!